We have photographers and videographers in Bismarck, Fargo, Minot, and Dickinson ND, Rapid City SD, Minneapolis and St Paul MN, as well as Colorado Springs CO. There are no travel costs for portrait sessions (including engagements) and commercial shoots in the cities we have photographers and videographers. Meet the photographers and videographers on our Team page HERE! 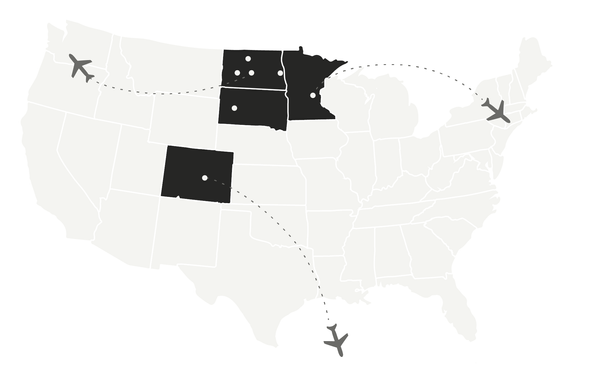 And there are no travel costs for weddings in North Dakota, Minnesota, Colorado, South Dakota, New Mexico, Iowa, Wisconsin, Nebraska, Wyoming, and Montana! We also travel regionally, nationally, and internationally. Our main studio in Bismarck, ND is located in the same building as Humpback Sally's and Lüft, in downtown Bismarck. You are able to park on the street or in the large, white 6th Street Parkade parking ramp. If parking on the street, after entering the building, head down the first floor hallway and take the back elevator to the 3rd floor. (It is best to avoid the stairs as they can be confusing!) If parking in the Parkade, which we highly recommend, you can access our floor from the Green Level. There is hourly parking right in front of the skywalk into the building. Bring in your parking ticket and we will validate your parking so there's no cost to you!